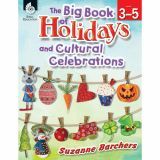 Make learning about holidays and cultural celebrations fun and engaging! These handy resources are filled with ready-to-use reproducibles, fun facts, puzzles, crafts, and more. 280-296 pages + CD.